Gaston Jean Baptiste was born at the Palace of Fontainebleau on 24 April 1608 and at birth was given the title of Duke of Anjou. As a child, he was raised under the supervision of the royal governess Françoise de Montglat. In 1626, at the time of his marriage to the young Marie de Bourbon, Duchess of Montpensier, he received in appanage (with their respective titles) the duchies of Orléans and Chartres, and the county of Blois. He had nominal command of the army which besieged La Rochelle in 1628, having already entered upon a course of political intrigue that would occupy the remainder of his life. He was the heir presumptive to the throne of France from the death of his brother Nicolas Henri in 1611 until the birth of his elder brother's first son in 1638. On two occasions, he had to leave France for conspiring against the government of his brother and his Prime Minister Cardinal Richelieu. After waging an unsuccessful war in Languedoc leading to the Battle of Castelnaudary in 1632, he took refuge in Flanders. Reconciled with his brother Louis XIII, he plotted against Richelieu in 1635, fled from the country again, and then submitted to the King and the Cardinal. 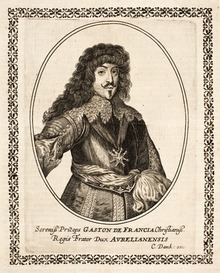 Gaston first married on 6 August 1626, at Nantes to Marie de Bourbon, Duchess of Montpensier, daughter and heiress of Henri de Bourbon, Duke of Montpensier. They had a daughter, Anne Marie Louise d'Orléans, Duchess of Montpensier (29 May 1627 – 5 April 1693), called Mademoiselle de Montpensier, but later being best known as the Grande Mademoiselle. Marguerite Louise d'Orléans (28 July 1645 – 17 September 1721) married Cosimo III de' Medici, Grand Duke of Tuscany and had issue-but line died out. Élisabeth Marguerite d'Orléans (26 December 1646 – 17 March 1696) married Louis Joseph of Lorraine, Duke of Guise and had issue-but line died out. ^ Patmore, Katherine, The Court of Louis XIII, Methuen & Co, 1909, p. 144. ^ Chisolm, Hugh, Encyclopædia Britannica, Published 1911, p. 284. ^ Campagnes de Charles IV, duc de Lorraine et de Bar, en Allemagne, en Lorraine et en Franche-Comté, 1634-1638, d'après des documents inédits, par F. des Robert, Paris, Nancy, 1883, p. 336. ^ a b Jiménez, Consuelo Juanto. "Enrique II de Albret". Diccionario biográfico España (in Spanish). Real Academia de la Historia. ^ a b Anselme 1726, pp. 210–211. This article incorporates text from a publication now in the public domain: Chisholm, Hugh, ed. (1911). "Orleans, Jean Baptiste Gaston, Duke of" . Encyclopædia Britannica (11th ed.). Cambridge University Press. This page was last edited on 14 November 2018, at 22:08 (UTC).